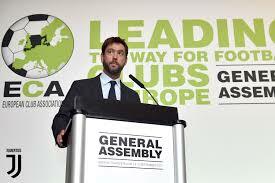 Following its general assembly in Amsterdam, the European Clubs Association said its members would stand firm and oppose competing in the new-look 24-club global competition which FIFA wants to start in 2021 in place of the Confederations Cup. The Club World Cup, traditionally a warm-up event for the World Cup proper, currently comprises just seven teams and is one of FIFA’s most unloved competitions in its current guise. Infantino, who has trumpeted the new-look competition as a milestone in football history, ideally wants eight of the clubs to come from Europe, generating significantly increased revenues for both parties. But with the new-look tournament slated to last from June 17 to July 4, ECA chairman Andrea Agnelli (pictured) said his members were collectively agreed on boycotting the event as it stands now because of an already congested calendar, despite reports that one or two major clubs were privately in favour. He also pointed out that FIFA had given no information about how Europe’s club would qualify given that there will be three European club competitions by then. “I don’t understand how we could possibly take part today since there is nothing about access. We need more detail before we can commit to such a project. We are the ones investing in players, infrastructure, youth development.